Several months ago, Sophia Khan engaged me on Twitter and I decided to visit her site to understand her point of view. I must say I was stunned by the whispery delicacy and magical powers of her paintings, a paradoxical mélange of attributes that is rare to find within the same oeuvre. 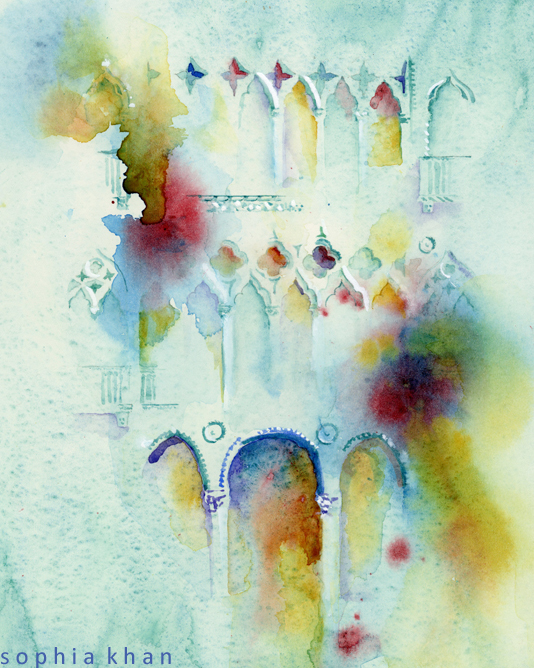 I asked her if she would tell me a story relating to her paintings, to her impressions of Venice and to a book she’s read that evokes the sensation of Venice in her mind so I could feature her here on the blog, and, fortunately, she said yes. “Glorious Encounter, A Venetian Vista”; © Sophia Khan. As I lay these four watercolors side by side, the following words come to mind, one for each image: Romance, Celebration, Mystery, Surprise. And as I reflect on the inspiration for painting these impressions of Venice I cannot help but remember the time when I first traveled to Italy, as an architecture student. How I learned, in Venice most of all, that the richness of experiencing a place is far beyond understanding through words, text, and images, and is conveyed primarily through presence. 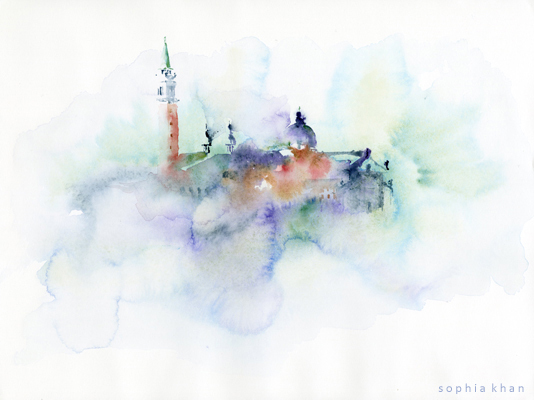 “Mystery of San Giorgio Maggiore”; © Sophia Khan. 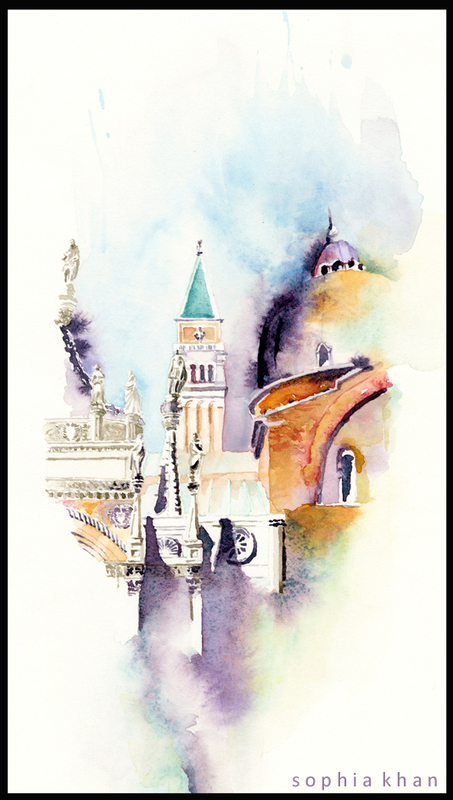 Each of these watercolors was painted while being away from Venice. However, it is exactly this tangible experience of place and having once been there that gives these works their expressive and interpretive aesthetic, and allows them to communicate the above words, which Venice evokes for the traveler. The places we travel too often become associated with specific emotions we may have felt relating to where we were in our lives when we happened to travel there. Some places may be associated with healing, others with adventure, tranquility, or romance. For me, Venice evokes a time of awakening; of learning much about myself, my place in the world, and about the mysteries of life. As such, it has become a subject I return to the most, perhaps because it is layered with so much meaning and personal relevance. 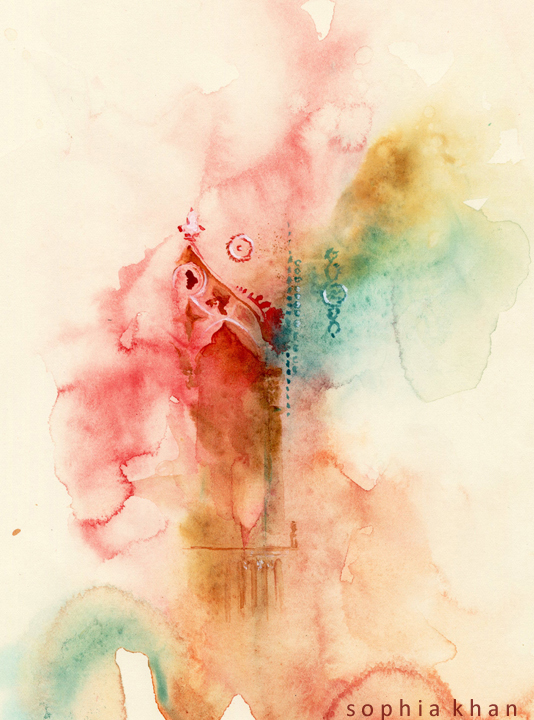 Looking back at these watercolors now, I feel they were also a way for me to travel to Venice once again through remembrance, and to celebrate the time I spent there as well as temper my longing to return. “Ca’ d’Oro, Venice, Celebration”; © Sophia Khan. It is interesting to be prompted to write about a book that relates most to my experience of Venice. Although there are many books relating to the city that I enjoy reading, including well know memoirs, classics, and architectural history books, there is one rather obscure book that unexpectedly created a very powerful experience for me: A Daughter of Venice written by John Seymour Wood in 1892. I resume my diary—neglected for so many months—for the reason, sufficiently satisfactory to myself, that here, in Venice, those who come after me, and who may see fit to peruse it, will find written less of myself and more of what I note in this strange, sad old city. These words ignited a curiosity, a sense of being reconnected to Venice, and a sense of adventure in me, so I decided to dedicate a blog to the experience of reading this book. It soon developed into a dialogue with the narrator. His words prompted me to dig deep into my own thoughts on Venice in a manner I had never before done. The time that I began this blog correlates with when I began to paint watercolors more regularly. I do believe that, on some level, this period of delving into my experience of the city, of taking the time and care to write about how I viewed it, has lead me to a style of painting Venice, and other places I have travelled to as well, that is highly personal and emotive. “Distance and Desire”; © Sophia Khan. I’d like to thank Sophia for sharing her experience of Venice and her responses to this marvelous book for this DesignStudio post. I have just downloaded A Daughter of Venice into my iPad and will be reading it during my next trip to that wondrous city in November. What a remarkable legacy this artist is leaving to the world! And don’t forget to stop by her site to enter her Valentine’s Giveaway for a copy of JoAnn Locktov’s new book and a set of notecards featuring the Distance and Desire painting, which is shown to the left. The contest ends this coming Friday, February 13, so time is of the essence! Happy Valentine’s Day to all of my loyal readers. I can’t thank you enough for keeping me writing week-in and week-out. Knowing you are stopping by makes it all worth-while! The Modern Salonnière and Impressions of Venice © Saxon Henry, all rights reserved. Saxon Henry is an author, poet and strategist. Her books include Anywhere But Here, Stranded on the Road to Promise and Four Florida Moderns.